"Jackson has lost his left arm; I have lost my right." One of the best classes any undergrad could take at The University of North Carolina at Chapel Hill in the mid-1970s was the Civil War history class taught by Dr. James Leutze. He brought the facts and figures of that bloody war to life each day in class. The Civil War generals and politicians and people seemed to magically come alive with each and every passing class. One of the most searing images was his recounting of how Confederate General Stonewall Jackson was mistakenly shot in his left arm at the Battle of Chancellorsville by his own troops as he was reconnoitering the Union lines after his brazen and successful flanking maneuvers that brought victory to the Rebel troops. We were so taken by this story that we trudged through the muck and mud one day soon after graduation trying to find where his amputated left arm had in fact been buried. Under a small copse of trees, right where Dr. Leutze said it would be, we saw the small headstone. (photo above) We marveled that the doctor and his team who had amputated thousands of limbs up to that point in time during the War Between the States would take the time to find Jackson's severed left arm in the pile of dead limbs outside of the field hospital and give it a proper burial near Ellwood Plantation in Orange County, Virginia. General Jackson died 8 days later on his way to Richmond and was buried later in Lexington, Virginia never to be reunited with his left arm in death. We bring that story up not only to praise Dr. Leutze's teaching ability but to point out his fine attention to the details of history. 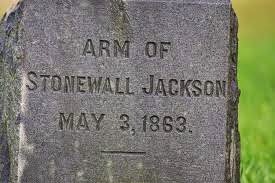 Anyone who knew about where Stonewall Jackson's left arm was buried sure knew how to dig through a lot of research and come up with the truth. Dr. Leutze went on to do great things in the UNC system, most prominently at the University of North Carolina at Wilmington where he now serves as Chairman Emeritus. We met with him several times when he came to Capitol Hill to discuss matters of importance to the UNC system as well as specifically UNC-Wilmington. We bring this up not to lambaste Dr. Leutze whom we hold in high regard. We bring this up more to point out the significant difference between 'politics' and 'history'. History entails looking at all the facts of any event or time in the past and try to bring some sense of proportion to the modern reader. Politics, on the other hand, looks at one side of any issue, present or past, and tries to beguile the registered voter into 'seeing things your way', not the other way. For one thing, maybe some eager junior editor sought to gin up reader response with such a provocative headline. Does he really mean that the Republicans now in charge of running the state of North Carolina government has actually taken the 8th largest state in the Union back to 1914 living standards right before World War I broke out? Surely that can't be true, can it? In this opinion piece, Dr. Leutze departs from looking at the totality of recent history, say the last 3 where Republicans have finally had a chance at running this great state of ours after 140 years, and takes the usual liberties that any seasoned politician, consultant or partisan would take. This is entirely fair to do in a democratic republican form of government such as ours. Both sides do it so 'c'est la guerre' as the French would say. But is Dr. Leutze writing here as a dispassionate historian or as an active partisan of modern-day politics? Let's take a look at some of Dr. Leutze's claims and see if they really hold water as a historian first. We know he is a great historian because he was telling the truth about Stonewall Jackson's left arm and we saw it for ourselves. How about this claim that 'North Carolina has turned back 100 years' as the title of his opinion piece claims? Is that really 'true' or just 'hyperbole' that anyone can expect in the public square today? The new laws don't even go into effect until the 2016 elections in the first place! So how can it be proven that the new voting laws will suppress ANY voter turnout along any lines when they have not even been implemented yet? If you are a law-abiding citizen, you have got to have a photo ID of some kind to partake of ANY activities at any of the offices or stores in North Carolina or the United States of America. The only place in America where you do not need a photo ID or any sort of positive identification today is apparently the voting booth. Again, we don't mind some hyperbole in any political discussion. But we have to ask: 'Who and what are the plutocrats in North Carolina today anyway? And is North Carolina really in a 'Rip Van Winkle slumber' today in 2014? The tobacco, textile and furniture barons of the late 19th century and most of the 20th century are gone as are hundreds of thousands of the relatively stable manufacturing jobs that went overseas to lower wage cost countries. Many small communities in eastern and western North Carolina would give anything to have those jobs back instead of seeing most of their population now on unemployment or most of their buildings boarded up. Who are the 'plutocrats of North Carolina' today unless they are the founders of the high tech and health care giants that thankfully still call North Carolina home and employ tens of thousands of highly skilled people who come out of our Research Triangle Park universities and laboratories? For every Art Pope on the right side of the political spectrum, there have been 10 on the liberal side of the North Carolina political spectrum willing to fund any and all liberal causes for the past half century. Are rich people on the left not 'plutocrats' simply because you agree with them? You know what is really odd? No one on the progressive liberal side of the aisle ever brings up the inconvenient truth that the real reason why schools, including primary, secondary and higher education and infrastructure face shortfalls in funding is because of close to $2.5 billion that was spent on over-runs in the mismanaged state Medicaid program under the Democrats' rule prior to the GOP takeover in 2012. The computer systems were antiquated and insufficient to handle the claims made on Medicaid by the state hospital and physician care community. On top of that, the General Assembly under Democrat control never considered moving to a Medicaid Managed Care plan adopted by 39 other states in the Union, some of which have now saved billions in their Medicaid program. Where can those savings ostensibly be spent? On teachers' salaries; the UNC system; community colleges, infrastructure (although we would prefer that every road in North Carolina be re-paved first) and yes, further tax cuts. There had to be some economic effort to jumpstart job growth under the Republicans when they took over all of the reins of government in North Carolina in 2013. Republicans prefer tax cuts as their economic stimulus packages; President Obama and liberal Democrats prefer 'job-ready' infrastructure spending projects as their economic stimulus packages. It is like the swallows returning to Capistrano every year at the exact same time. It is just what both parties 'do'. The added cost of Medicaid over-runs plus the lost savings for each of the past 5 years brings the marginal cost of Medicaid to over $5 billion that has been spent on that one single program in the state budget that did not need to be spent had Medicaid been run in a more responsible, fiscally sound manner. '1/2 billion in revenue shortfall' pales in comparison to these $5 billion in lost Medicaid savings. Congressional redistricting has been done by the majority party for the advantage of the majority party in every state since the Founding of the Republic in 1789. To assert that the GOP majority did something nefarious in 2011 when they won control of the legislature for the first time in 140 years and they now have 9 out of 13 congressional seats, soon to be 10 after this fall's elections in 2014, the very same thing could be said about the Democrats when they were in charge but you almost never ever hear it said today. So what can be learned today? There is a huge gulf of difference between 'history' for history's sake and 'politics' for politics sake. Reinhold Niebuhr once said: 'Politics is the art of finding approximate solutions to basically insoluble problems'. It would help if both sides could use the same set of data before launching broadsides into each other. For many years, North Carolina was known as the Rip Van Winkle state because it was so backward. Stingy public officials and business tycoons wanted low wages and low taxes so there was little investment in civic needs. Roads and other public facilities were ignored while education of the state’s youth was minimal. The state was governed by the whims of a plutocracy of landed aristocrats, then tobacco barons, monopoly industrialists and eventually bankers and insurance executives. They had little use for an educated workforce or civic infrastructure. Too often they viewed things through a racist or misogynistic prism. The constitution of 1898, established after the political coup in Wilmington, effectively suppressed African-American voting. The state’s leadership refused to ratify the 19th Amendment for women’s’ suffrage, (symbolically ratified in 1971) and kept Native Americans from voting until the 1950s. The leaders also kept taxes low and regulation lax. As late as the 1950s, historian Hugh Lefler noted that North Carolina was not moving in the right direction. Industrial wages had stagnated, per capita income near the basement (46th out migration increasing, and tax revenues failing to meet critical public service needs. In the 1960s North Carolina experienced a transformation, melding with the modern world. Governors Kerr Scott, Luther Hodges and Terry Sanford moved to join the mainstream. While Scott, Hodges and Sanford initiated the modernization momentum, it was in 1977 when Jim Hunt became governor that the state began the steady climb in education, civic improvements and broader prosperity. Critical to Hunt’s success was recruiting the business community and selling it on his agenda of public education, government services and modest environmental protection as critical to industrial and economic advancement. The Research Triangle Park blossomed into a high-tech, high-wage and high-skilled business recruiting dynamo. Charlotte emerged as one of the nation’s leading financial centers while other areas of the state saw schools, community colleges and universities provide a trained labor force. The state’s national ranking rose under Democrat Jim Hunt and Republican Jim Martin (28th capita income in 2000). It seemed this new course had been irreversibly set. However, today that trend is in jeopardy. The shadows of the state’s Southern regressivism had never vanished. Paralleling Hunt’s career was that of Jesse Helms, with his hallmark arch-conservatism and race-baiting rhetoric. Starting in the mid-1970s, Helms and other conservative Republicans set up think tanks to give academic rigor to their ideology, recruiting bright lawyers and conservative journalists. In North Carolina one recruit was Art Pope, heir to a discount retailing fortune. Pope turned his energies toward establishing the John Locke Foundation and a stable of spinoffs. He joined with out-of-state forces like the Koch brothers and their Americans for Prosperity. Ironically, it might have been the election of 2008 that sparked the GOP sweep of 2010. The Red State Project headed by Ed Gillespie and Karl Rove determined that to control a state and ultimately the federal government, they needed to take a sufficient number of state legislatures in a census year – thus controlling legislative redistricting. With that prize in view, Pope and Americans for Prosperity poured in millions. Republicans swept to victory in both the state House and Senate in 2010. They then imposed a redistricting plan that maximized the GOP strength and will likely keep them in place for at least the next decade. While the 2010 GOP campaign mantra might have been jobs, jobs, jobs, it was quickly jettisoned to focus on divisive social issues, appealing to the newly labeled “tea party” base. Just as had been done after 1898, they attacked voting rights, taxes, public schools and added to them contemporary issues of gays and abortion. The new GOP-dominated legislature passed the nation’s most restrictive voter ID law and lowered taxes on the wealthy – causing a half-billion revenue shortfall – thus starving schools and infrastructure. They added mean-spirited cuts in unemployment benefits and Medicaid and eliminated the Earned Income Tax Credit. In four years they laid waste to 40 years of moderate progress. In 2012 the new Republicans added the governor’s mansion to their booty. Redistricting had been so masterful that they won nine of 13 seats despite the fact that almost 200,000 more votes were cast for Democratic than Republicans in the state’s combined congressional races. The business community Hunt had so carefully and effectively courted abandoned the progressives. The N.C. Chamber imported a director from Kansas who emphasized the old standbys: low taxes, low government spending, weak regulations. The plutocrats seem content to let North Carolina go back to Rip Van Winkle’s slumber. Now comes the 2014 election. In this off-year contest, incumbent Democrat Kay Hagan is locked in a tough race against Republican House Speaker Thom Tillis. When Tillis won the GOP primary, it was curiously hailed as a victory for the mainstream despite the fact that Tillis leads tea party forces in the legislature. Over $20 million of out-of-state money has poured in to defeat Hagan – control of the U.S. Senate hangs in the balance. Will the election be determined on the effectiveness of voter suppression efforts or will voter discontent for what is going on in Raleigh outweigh discontent with Washington government and the U.S. Congress? Dr. James Leutze is chancellor emeritus of the University of North Carolina-Wilmington. Isn't The 'Best' Jobs Policy Just Getting A Job?